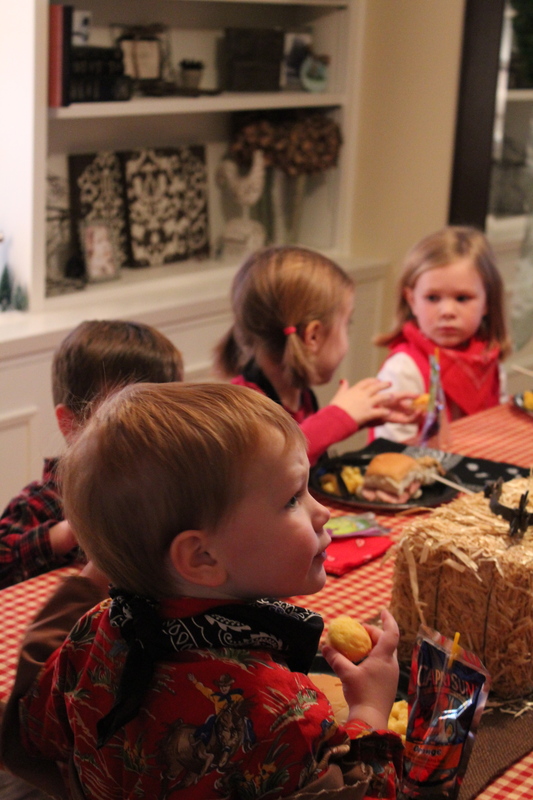 Welcome to Cowboy Party: Part Deux…or as less fancy folk call it, Part Two. In honor of all the Spring Break partying happening in the Southern United States, and most notably not in my house, I thought it was appropriate to feature the only type of partying I find myself partaking in these days: my children’s birthday parties. 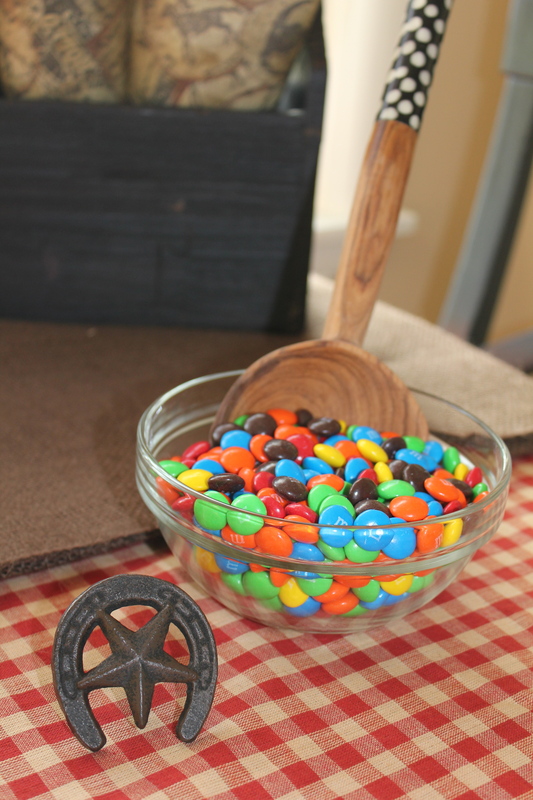 Yesterday’s post featured some of the photos and details of my son’s recent cowboy birthday party. Yesterday it begins…today it ends! If you missed any of the action, see yesterday’s boot-stompin’ fun post here. I like to wrap my gifts with papers and trimmings that coordinate with the party theme. Big sis was enlisted to help open the presents. Here she is practicing her “Ohh!” and “Ahh!” face. So supportive. 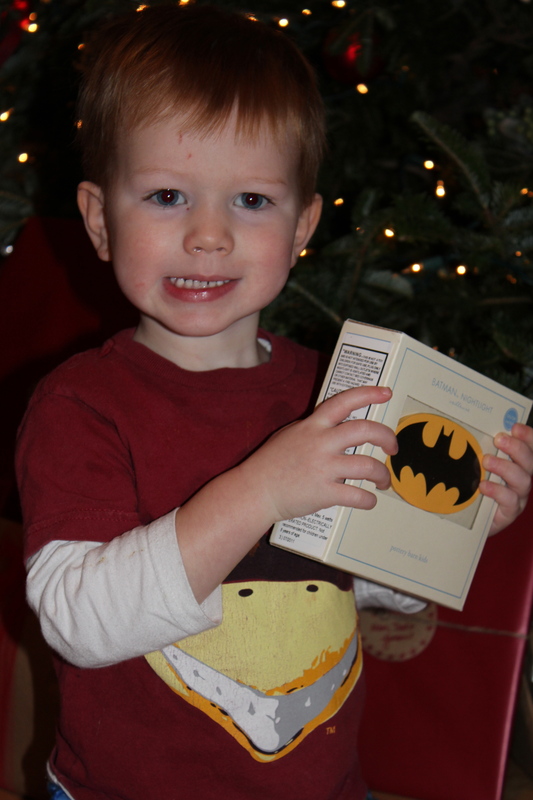 We knew the Caped Crusader would have to make some sort of birthday appearance. Actually, he made several. He may have lost out to cowboys in the party theme department but he definitely rose again in the gift giving arena. On to the party! 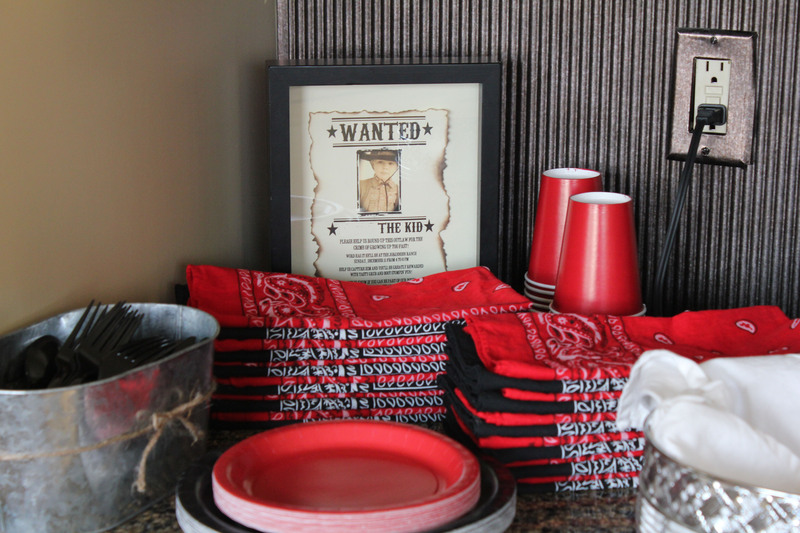 Here we have the party dinnerware station. Once again Beaut.two’s Photoshop-altered invitation takes center stage. 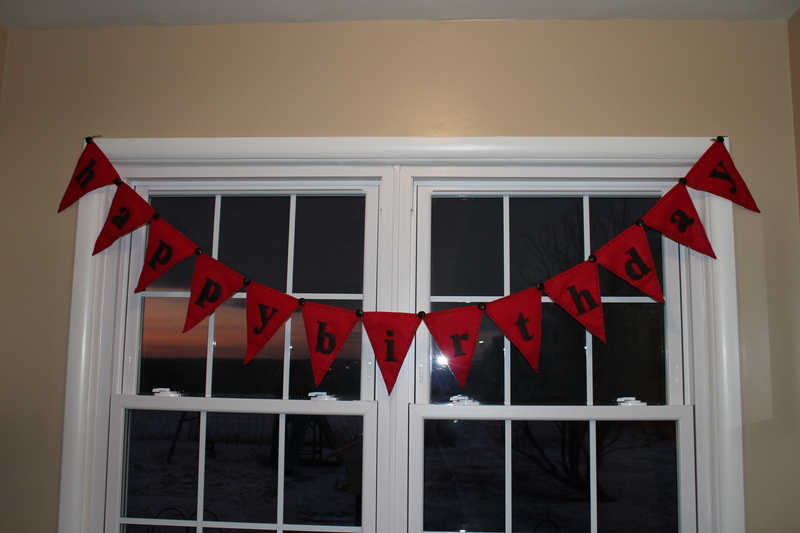 The brown and red felt Happy Birthday banner I stitched by hand. I have a small felt obsession. O.K., it isn’t exactly small. I’m going to get help. Later. For step-by-step instructions visit this previous post. The party menu screamed Southern comfort: homemade macaroni and cheese, mini cornbread muffins, green bean casserole, homemade caramel corn (Commonly referred to as ‘crack corn’ in our family, it is that delicious. Thanks Mom! ), S’more pops, cherry limeade and chocolate sheet cake. Lord have mercy, we need to re-enact this menu pronto! 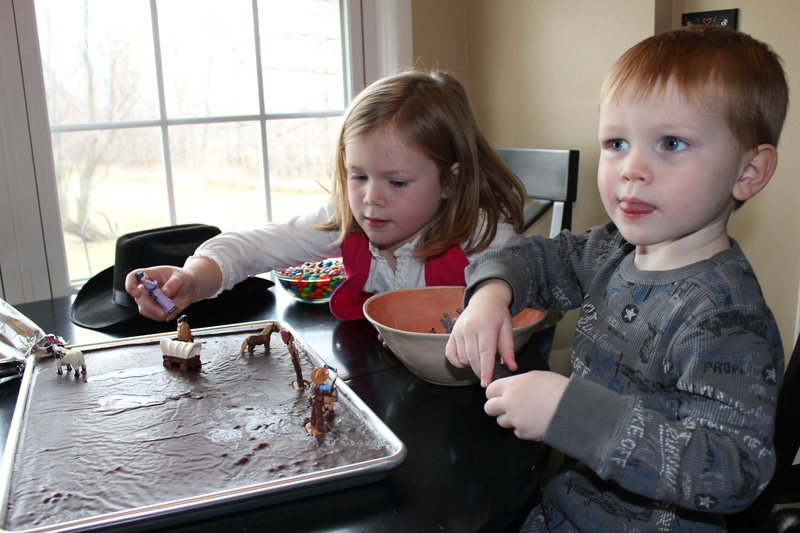 The star of the party was The Pioneer Woman’s The Best Chocolate Sheet Cake.Ever. 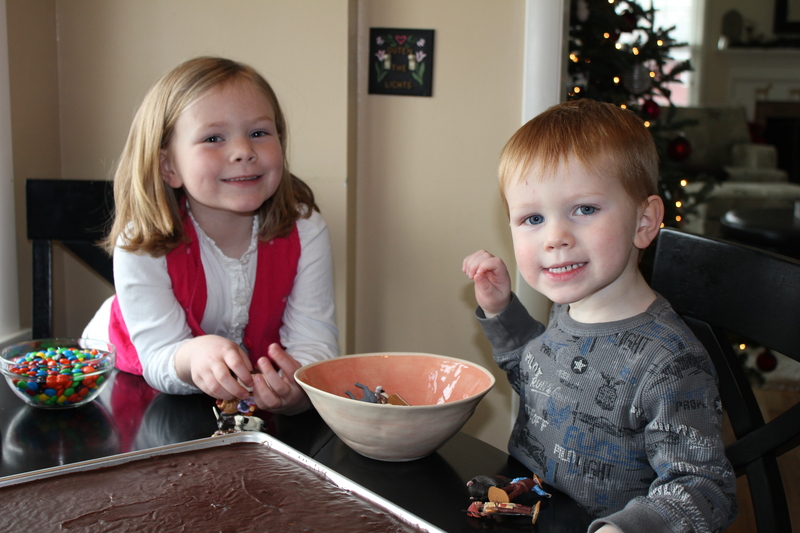 I had never made a sheet cake before and I did not have a party back-up plan, so I was relieved when it worked out. It more than worked it. It truly was a thing of culinary beauty. With the delicious aroma of the cake filling the house, it was a minor miracle that I didn’t accidentally fall face first into the cake and then eat my way out. 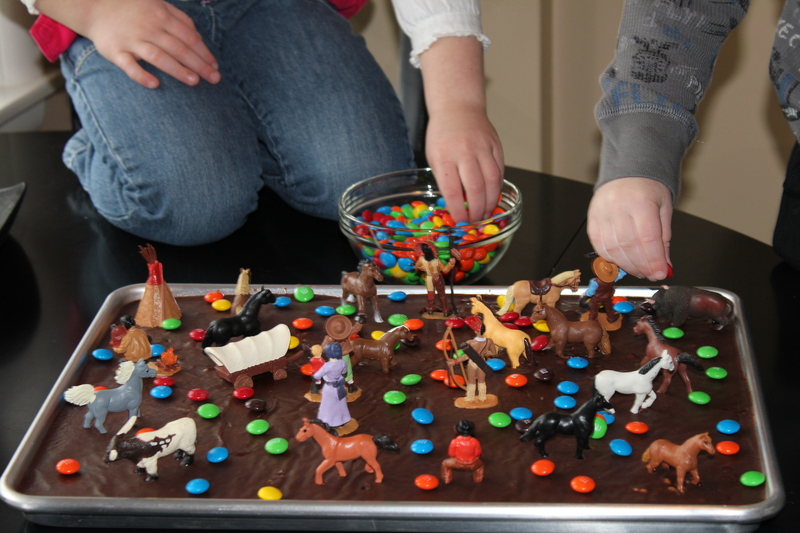 Begrudgingly putting aside my cake-eating fantasy until my birthday, I then had the beauties decorate this cowboy cake with plastic figurines and M&Ms. 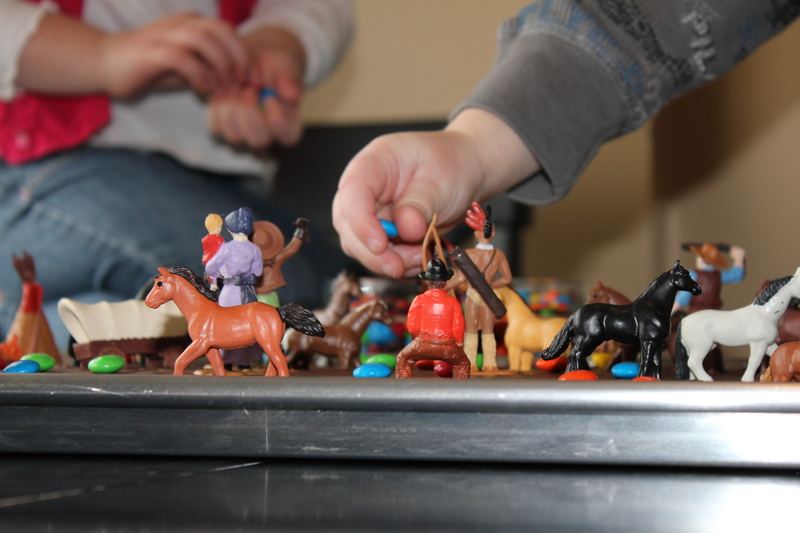 Cowboys, horses, chuck wagons, oh my! 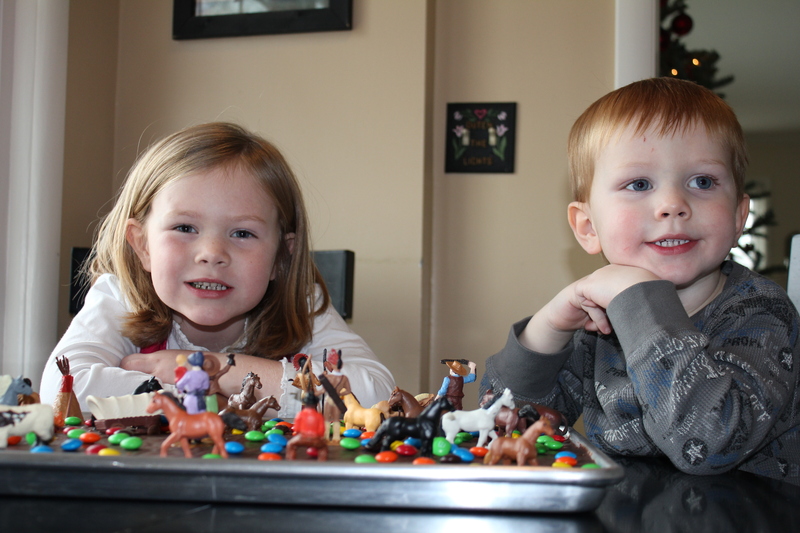 The cake bakers look pleased with their creation. They turned on me shortly after this photo was taken once they realized we weren’t going to eat it right now. I’m not going to lie. It got ugly. Real ugly. And an added cake bonus? 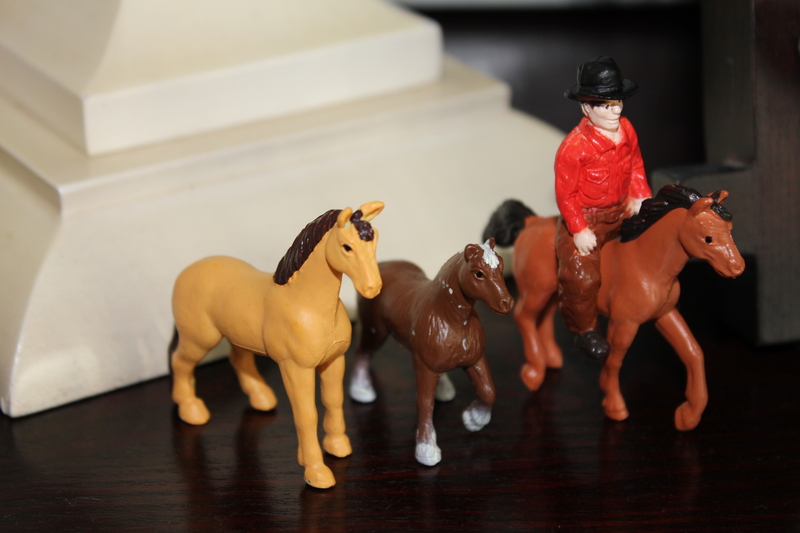 I used the extra Toob figurines to create small vignettes around our home to enhance the party vibe. S’more pops. 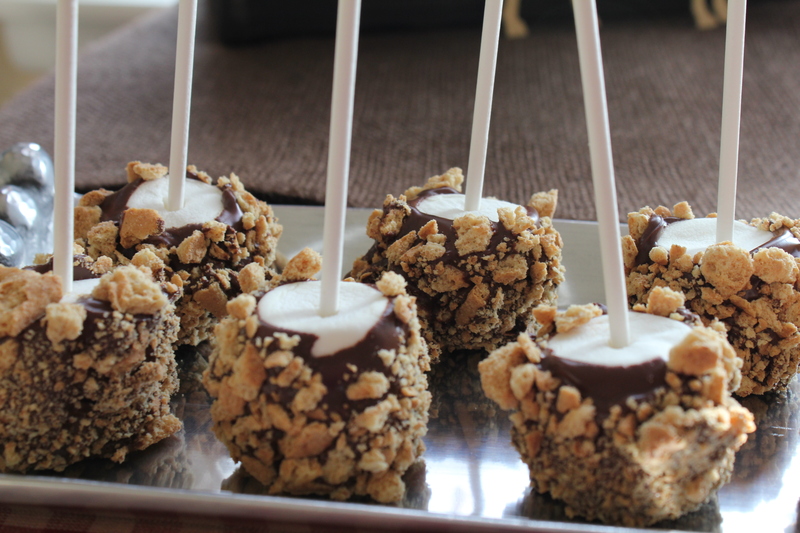 Delectable S’more pops. And so simple. Insert sticks into marshmallows. Crush graham cracker cookies. Melt chocolate chips. Roll the marshmallows in the melted chocolate and then in the graham cracker crumbles. Done! Excuse me while I head to the kitchen to crush and melt stuff. And the extra M&Ms made it to the party too! Isn’t that horseshoe perfect? They are really drawer pulls but they worked perfectly as food table decor. The tool trug in the background of the photo held the homemade cones of caramel corn. 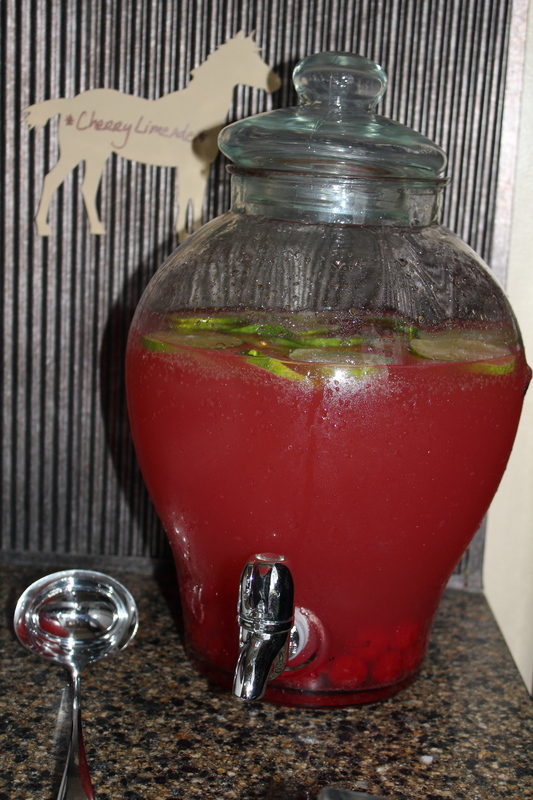 And we drank The Pioneer Woman’s Cherry Limeade. Um…maraschino cherries in anything has my vote. 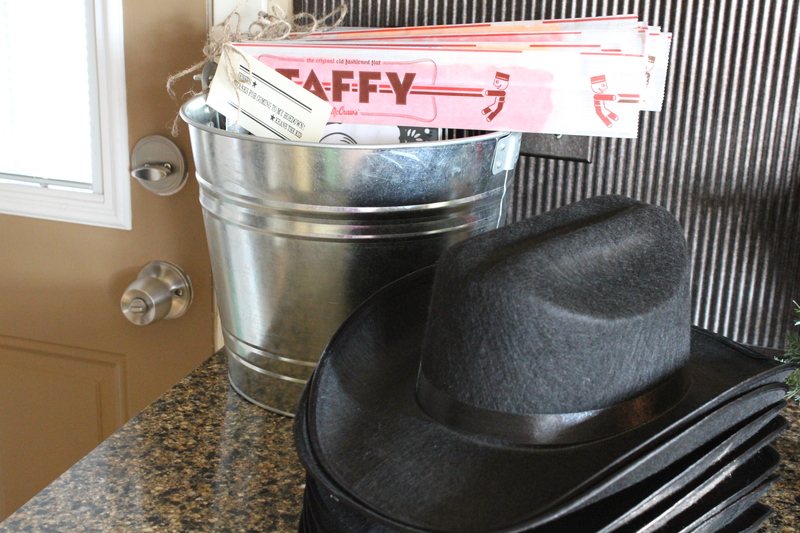 As the party guests (the young ‘uns) arrived, they received a black cowboy hat. 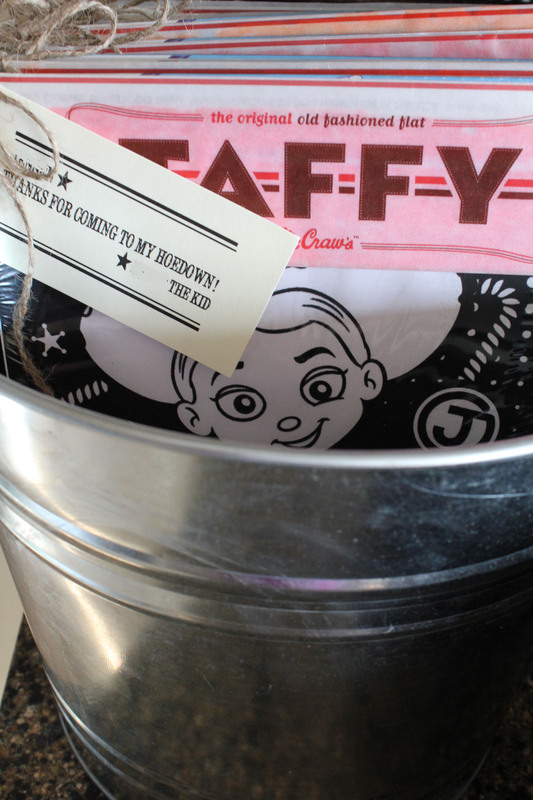 And here are the party favors; Old-Fashioned Taffy (in various flavors) and Toy Story’s Jessie and Woody coloring activities. Party guests enjoying the grub. Notice that they aren’t wearing their hats to eat. 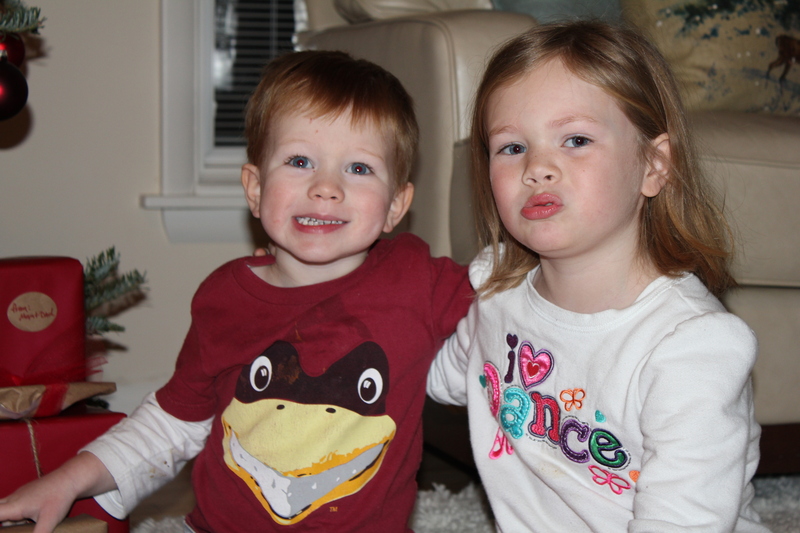 I couldn’t be more proud of my polite buckaroos! After the conclusion of the song he decides now is the time to institute a little shyness and he slowly glances around as though it just dawned on him that these party guests are here, in his dining room and that they’re watching him. Tick, tock! Tick, tock! My arms are screaming! 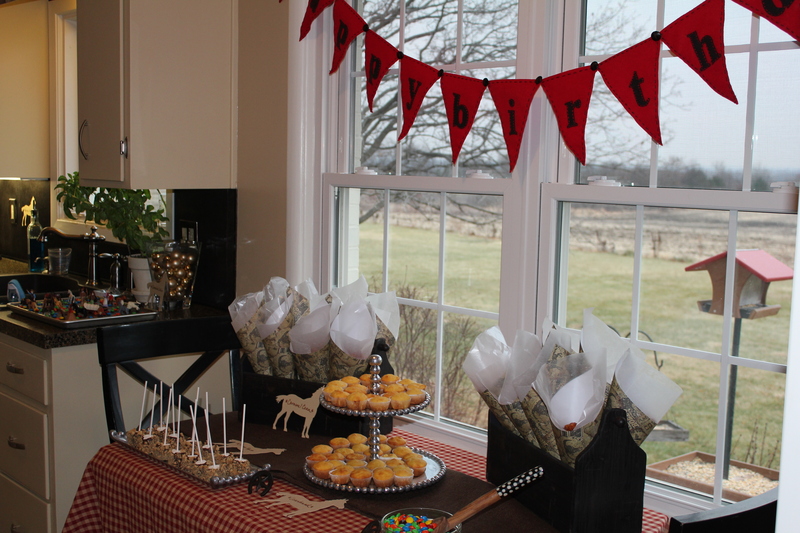 If you are looking for a fun, affordable and adorable party theme, a cowboy party will make all your dreams come true. Well, all of your party dreams. Promise. What is your favorite party theme? 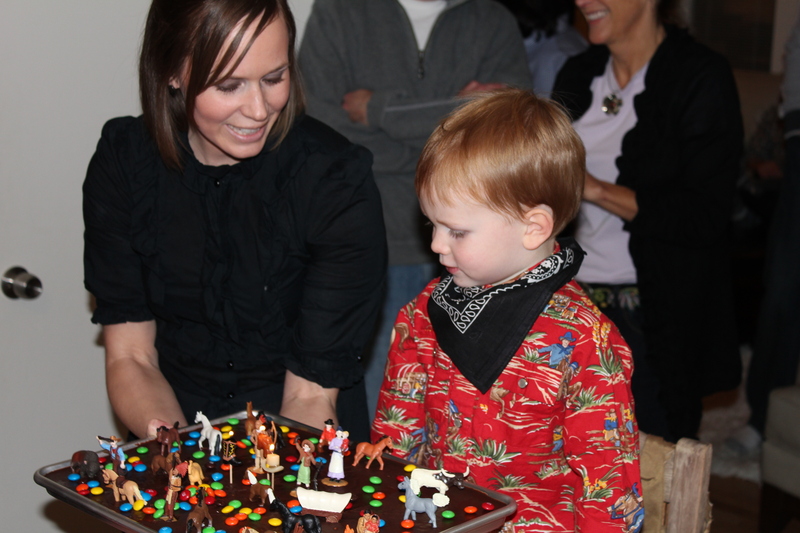 Have you ever pulled off a cowboy party? What type of party are you planning next? Can I come? 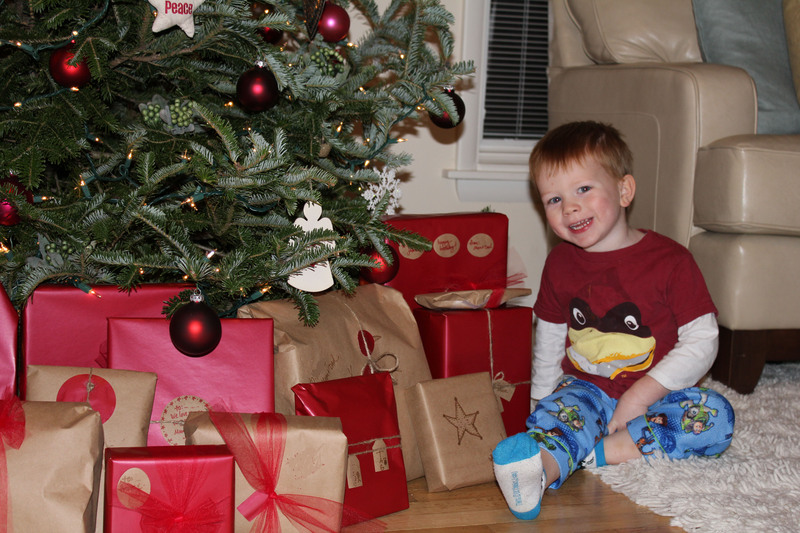 What an adorable theme – thanks for sharing! One of my favorite party themes yet! 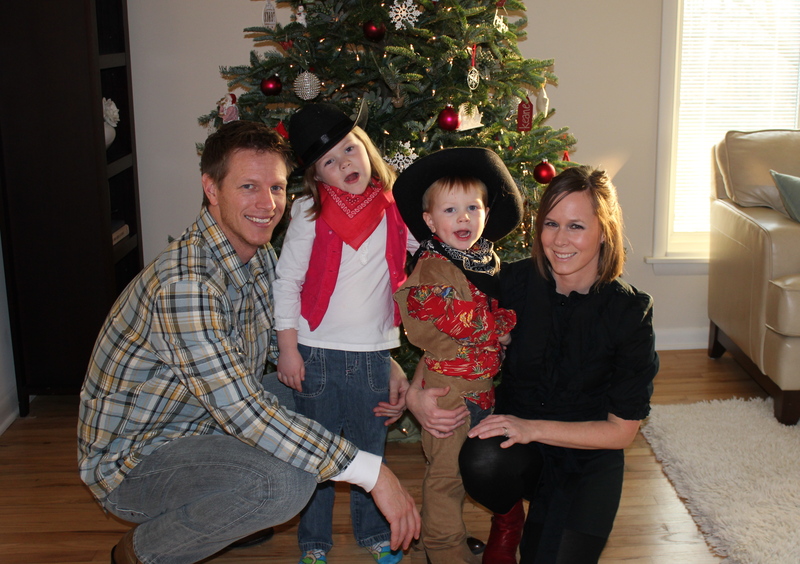 Our posse had a hoe-down great time! Yes, yes they did! It wouldn’t have been the same without the cowboy get-up. Thanks again!